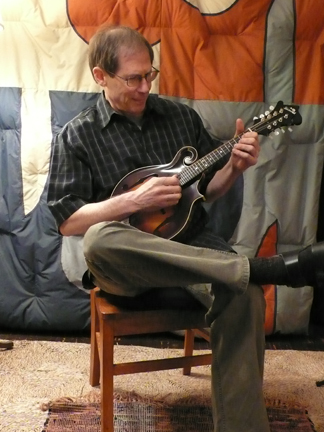 with my primary instruments the mandolin (including the mandola and cittern) and banjo (both 5-string and tenor). I also teach Irish music (including flute, tinwhistle, and bodhran). Music theory is at the center of my teaching method, and so I begin directly with grammar exercizes we enjoy playing and singing together. These seldom fail to convince the student that it is comfortable and encouraging to develop idea-making right along with the gathering of songs and technique. On this solid structural base the learning of one's style of interest, the actual speaking of its language, is with confidence. Distilled from forty years of teaching and hundreds of students of all ages and levels, my method has now come into focus and purpose - to build simple comprehendable vocabularies charged with harmonic clarity and rhythmic vitality. In the end the goal for all of us is to participate in the art of collective improvisation, to have the strength at our own technical level to give our instrument creative flight in ensemble with our friends. This is what the mental leverage of music theory gives us. Whether it's spinning variations into Irish tunes, weaving through an Appalachain modal song, taking a vivacious bluegrass break, pushing the rhythm and texture to the edge with the Delta blues, delivering us to turn-of-the-century New Orleans, or unearthing the sum of all of this with Bob Dylan's songbook - our instruments made conscious can carry us deep into the heart of our America. And beyond. Throughout my career I have explored extensively and woven into my teaching the cultural roots of the harmonic, melodic, and rhythmic elements of American musics. European traditions leading to classical music gave us our chordal foundations, Irish tunes delivered the melodic invention of bluegrass, and through the Malian blues and the African diasporas in Cuba and Haiti came the polyrhythmics of ragtime and New Orleans jazz. When Louis Armstrong's improvised melodies convened with Django Reinhardt's proto-European harmonies, Gypsy jazz was born. It's here that much of my music theory teaching now focuses.